Aile içi şiddet, günümüzde devam eden evrensel bir sorundur. Çalışmada sunulan olgu S., 33 yaşında, üniversite mezunu bir ev hanımıdır. S. yaklaşık dört yıldır eşi tarafından aile içi şiddete maruz kalmaktadır. S.’nin güçlendirilmesi ile şiddete "dur" diyebilmesi amacıyla Değişim Modeli uygulanmıştır. S. ile toplam 6 görüşme yapılmıştır. S.’nin evinde yapılan her bir görüşme, yaklaşık 1 saat sürmüştür. İlk dört görüşme bir hafta aralıklarla yapılmıştır. Beşinci görüşme, dördüncü görüşmeden bir ay sonra ve son görüşme ise beşinci görüşmeden altı ay sonra yapılmıştır. Uygulama toplam 10 ay sürmüştür. Yapılan ilk görüşmede S.’nin niyet aşamasında olduğu saptanmıştır. Değişim aşamalarına yönelik uygulanan değişim süreçleri (bilişsel ve davranışsal süreçler) sonrasında yapılan dördüncü görüşmeden sonra S., hazırlık aşamasına ve beşinci görüşmede ise eylem aşamasına geçmiştir. Son görüşmede ise S.’nin sürdürme aşamasında olduğu saptanmıştır. Aile içi şiddete uğrayan kadınlarda Değişim Modeli’nin kullanılmasının, kadının güçlendirilerek şiddeti durdurmasında uygun süreçlerin planlanması, müdahalelerin uygulanması ve değerlendirmesinde etkili olacağı düşünülmektedir. Domestic violence against women is an ongoing universal question. The case presented in the study is a 33-year-old housewife with a university degree. S. has been exposed to domestic violence by his wife for almost four years. With the empowerment of S., the Transtheoretical Model was applied in order to be able to say "stop". A total of 6 interviews were conducted with S. Each interview lasted about an hour. The first four interviews were performed at intervals of one week. The fifth interview was held one month after the fourth interview and the last one was six months after the fifth interview. The application lasted for 10 months. In the first interview, it was determined that S. was at the intention stage. After the fourth meeting after the change processes applied to the change stages, S. went to the preparation stage and in the fifth interview to the action stage. In the last meeting, it was determined that S. was in the maintenance phase. It is thought that the use of the Transtheoretical Model in women who are subjected to domestic violence will be effective in planning and implementing appropriate interventions and evaluating women’s empowerment in stopping violence. 1. Pehlivan M. Aile içi şiddette kadının mağduriyeti (Sakarya Söğütlü örneği). The Journal of Academic Social Science Studies. 2017; 58: 551-69. doi: 10.9761/JASSS7146. 2. Jahromi MK, Jamali S, Koshkaki AR, Javadpour S. Prevalence and risk factors of domestic violence against women by their husbands in Iran. Global Journal of Health Science. 2016; 8(5): 175-83. 3. Kalra N, Di Tanna GL, García-Moreno C. Training healthcare providers to respond to intimate partner violence against women. Cochrane Database Syst Rev. 2017; (2): CD012423. 4. Yaman Ş, Taşkın L. Emergency nurses barriers to intervention of domestic violence in Turkey: A qualitative study. Sexuality and Disability. 2012; 30(4): 441-51. 5. Knox B. Screening women for intimate partner violence: Creating proper practice habits. The Nurse Practitioner. 2018; 43(5): 14-20. 6. Prochaska JO, Diclemente CC. Transtheoretical Therapy: Toward a more integrative model of change. Psychotherapy Theory Research & Practice. 1982; 19(3): 276-88. 7. Reisenhofer S, Taft A. Women’s journey to safety- The Transtheoretical Model in clinical practice when working with women experiencing intimate partner violence: A scientific review and clinical guidance. Patient Education and Counseling. 2013; 93(3): 536-48. 8. Yaman Ş. Aile içi şiddete uğrayan kadınlara yönelik hemşirelik hizmetlerinde “Değişim Modelinin” kullanılması. Maltepe Üniversitesi Hemşirelik Bilim ve Sanatı Dergisi. 2009; 2(3): 130-5. 9. Burke JG, Denison JA, Gielen AC, McDonnell KA, O’Campo P. Ending intimate partner violence: An application of the Transtheoretical Model. American Journal of Health Behavior. 2004; 28(2): 122-33. 10. Fraiser PY, Slatt L, Kowlowitz V, Glowa PT. Using the stages of change model to counsel victims of intimate partner violence. Patient Education and Counselling. 2001; 43(2): 211-7. 11. Colaizzi PP. Psychological research as a phenomenologist views it. In: Valle RS, King M, editors. Existential-Phenomenological alternatives for Psychology. New York: Oxford University Press; 1978. p. 49-59. 12. Michau L, Horn J, Bank A, Dutt M, Zimmerman C. Prevention of violence against women and girls: Lessons from practice. The Lancet. 2015; 385(9978): 1672-84. 13. Pronyk PM, Hargreaves JR, Kim JC, Morison LA, Phetla G, Watts C, et al. Effect of a structural intervention for the prevention of intimate-partner violence and HIV in rural South Africa: A cluster randomised trial. Lancet. 2006; 368(9551): 1973-83. 14. Kim JC, Watts CH, Hargreaves JR, Ndhlovu LX, Phetla G, Morison LA, et al. Understanding the impact of a microfinance-based intervention on women’s empowerment and the reduction of intimate partner violence in South Africa. American Journal of Public Health. 2007; 97(10):1794-802. 15.	who.int [Internet]. World Health Organization (WHO). Global and regional estimates of violence against women: Prevalence and health effects of intimate partner violence and non-partner sexual violence [Update: 2013; Cited: 03.09.2018]. Available from: http://www.who.int/violence_injury _prevention/ violence/sexual/en/. 16. T.C. Aile ve Sosyal Politikalar Bakanlığı. 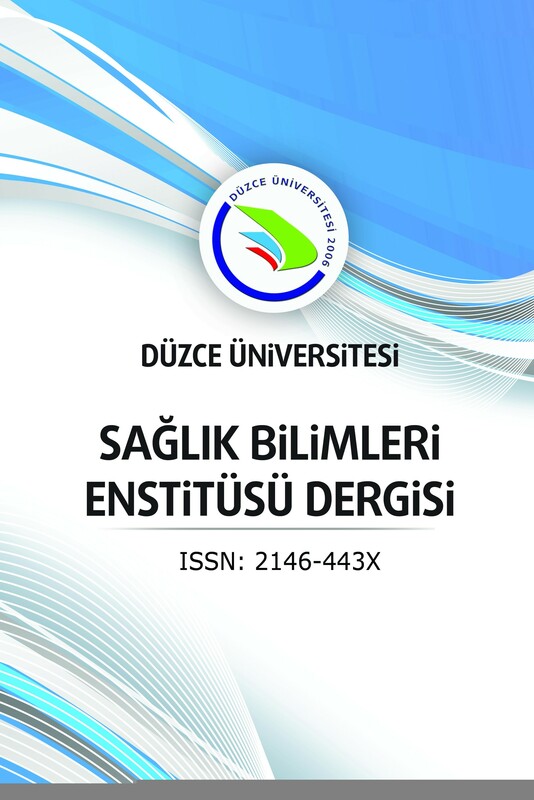 Hacettepe Üniversitesi Nüfus Etütleri Enstitüsü. Türkiye’de Kadına Yönelik Aile İçi Şiddet Araştırması. Ankara: Elma Yayıncılık; 2015. 17. Haggerty LA, Goodman LA. Stages of change-based nursing interventions for victims of interpersonal violence. Journal of Obstetric, Gynecologic, Neonatal Nursing. 2003; 32(1): 68-75. 18. Chang JC, Dado D, Ashton S, Hawker L, Cluss PA, Buranosky R, et al. Understanding behavior change for women experiencing intimate partner violence: Mapping the ups and downs using the stages of change. Patient Education and Counseling. 2006; 62(3): 330-9. 19. Catallo C, Jack SM, Ciliska D, MacMillan HL. Identifying the turning point: Using the transtheoretical model of change to map intimate partner violence disclosure in emergency department settings. ISRN Nursing. 2012; 2012. Article ID 239468. doi:10.5402/2012/239468. 20. Schrager JD, Smith LS, Heron SL, Houry D. Does stage of change predict improved intimate partner violence outcomes following an emergency department intervention? Academic Emergency Medicine. 2013; 20(2): 169-77. doi: 10.1111/acem.12081. 21. Burke JG, Mahoney P, Gielen A, McDonnell KA, O’campo P. Defining appropriate stages of change for intimate partner violence survivors. Motivational Interviewing and Stages of Change in Intimate Partner Violence. 2009; 24(1): 273-303. 22. Zink T, Elder N, Jacobson J, Klostermann B. Medical management of intimate partner violence considering the stages of change: Precontemplation and contemplation. The Annals of Family Medicine. 2004; 2(3): 231-9. doi: 10.1370/afm.74.